EP 36 – P. A. R. T. Y2K? Because I Gotta! On this episode of Dating Ourselves Podcast, not to be confused with Y2J, B2K, BTK, 401k, or WD-40, the guys talk about Y2K. 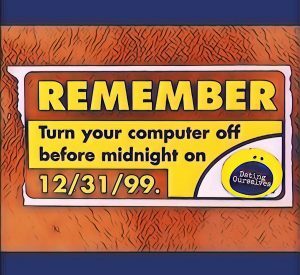 You know, welcoming the year 2000, the new millennium, and not having any idea if our computers would work? Check it out, as Brian mentions pots and pans (that he later gets accused of wearing), Paul arrives late to a meeting due to car trouble, and Adam is jonesin’ for a soda. Episode 35 – Gushers by… Betty Crocker? !